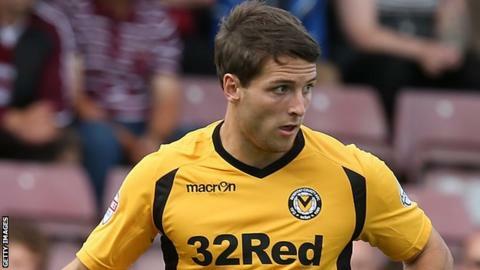 Peterborough United have signed Newport County striker Conor Washington for an undisclosed fee, with Shaun Jeffers moving in the opposite direction. Washington, 21, has signed a three-and-a-half-year deal at London Road. He joined Newport from St Ives in the summer of 2012 after a failed trial at Posh, and has scored eight goals in 48 games for the Exiles. Jeffers, also 21, will head to Rodney Parade after netting three times in 13 appearances this term. The former Coventry City front man joined Peterborough on a short-term contract in October. Meanwhile, St Ives, who play in the United Counties League Premier Division, will receive a portion of the Washington transfer fee as part of a sell-on clause. He scored 24 goals in 30 games for them before moving to Newport, with whom he won promotion to League Two last season. This term, he has seven goals from 32 games in his first campaign in the Football League. The signing of Washington follows unsuccessful moves for former Kidderminster striker Joe Lolley, now with Huddersfield, Dagenham & Redbridge striker Rhys Murphy and Rochdale's Scott Hogan.